Luigi's Catering is the caterer to provide you with exactly what you need to make your event flawless. When you are planning the perfect wedding, corporate function, or specialty event, you can turn to the experienced and knowledgeable event coordinators of Luigi's. We will make sure that everything is perfect down to the very last details. Let us help you with the planning and turn your event into something truly special to remember. With over 25 years of experience we have planned events from quaint backyard casual affairs, to elegant over-the-top weddings. There is nothing that we won’t do! > Customizable packages to meet your needs and fit your budget. 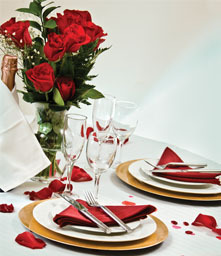 > Complimentary linen table cloths for the appetizer, beverage and food buffet tables. > Appetizer plates and napkins provided for the hors d'oeuvre selection. > Beverage station that includes beverage dispenser, cups, and beverage condiments. > The head table will be served by our staff so you never have to leave your seat. > We will provide decorative trays and display your cookies. > Please keep in mind our Wedding Buffet Collection packages are designed for groups of 100 or more. Custom packages for smaller groups are also available. Customers may call in and pick up orders from our takeout window in the rear of our building. You may order from our Takeout Menu or Family-Style Takeout Menus. Family style menu items may require up to 24 hour notice. A minimum order of $75 will have your food delivered hot and fresh, with a smile. (Local delivery in the DuBois are is free of charge. Please ask for the delivery fee when traveling outside of DuBois) *Delivery is not always available, please call for availability. 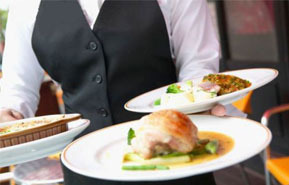 This service is for customers who would like our staff to set up and arrange your buffet for you. There is a labor fee of 20% is added to the total bill, and an additional fee of $50 is added for orders under 50 guests. Our staff will handle the set up of the buffet, so you don’t need to worry about a thing! We will serve guests from our buffet line and refill food as needed. Our staff will also clear guest tables and tear down the buffet. Trash is bagged if requested, but not removed. There is a labor fee of 20% added to the total bill, plus delivery if the event is not local. Linen rental is available upon request. Please call for sizing, colors and pricing. *If the event is outside of the local DuBois area, a travel fee will be added. Additional fees may apply to outdoor events and select venues. These fees are determined on a per party basis.